"A game where the players create and manage their own space program. Build spacecraft, fly them, and try to help the Kerbals to fulfill their ultimate mission of conquering space." After lots of testing, failed launches, waiting around for the planets to align *just so* and all that nonsense, my two-part craft to be assembled in orbit was finally launched. 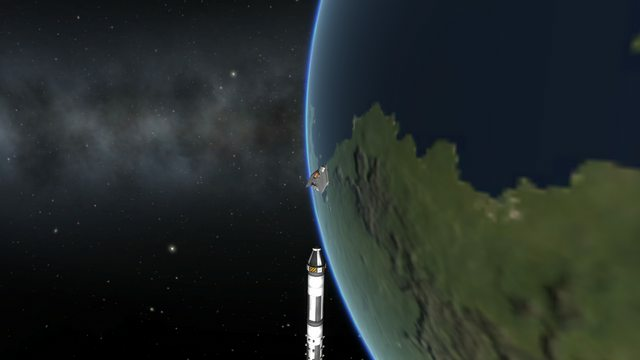 The command capsule, Tulkas, was launched first, and is designed, with its nuclear engine, to take the whole assembly all the way to Duna and back again. Following that, my Duna Excursion Craft, Nessa, was also launched, the launch timed closely so I could rendezvous with Tulkas and proceed to dock. Couple of things I learned from this experience. Firstly, be wary of KSP turning into a slideshow when too many parts are around. These aren't even the largest rockets I've launched (debris is probably causing my problems), but the game didn't like them much. Secondly, launching the CSM and DEC separately is a goddamn nightmare in terms of docking. I managed it, but it too quite a while, and I kept worrying about monopropellant levels so they could dock in Duna orbit. Thirdly, EVAs in space are awful. It's like docking, except if you haven't got many ladders around, because there's no attachment system you're terrified you'll fly away accidentally. In any case! They're now ready in orbit and waiting for their launch window. How high do you put your space stations/rockets to be docked/refuel stations in terms of altitude? All of mine seem to run out of fuel by the time they dock. 100 km is the standard for me. 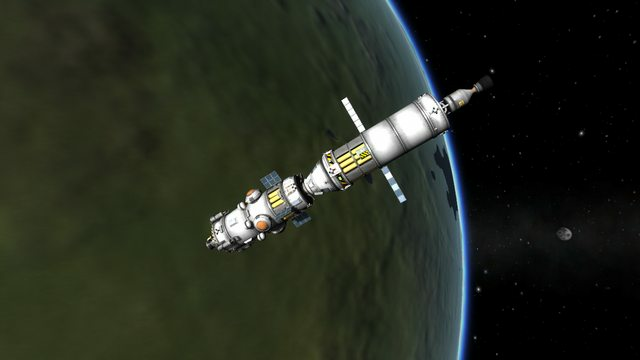 Though when I tried making a Molotov Space Station, it was at 400 km, I think. Some people have shittons of free time. And amazing imagination. 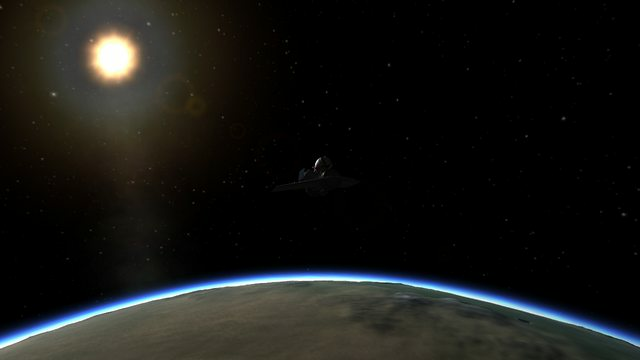 So I've been experimenting with ways to return Kerbals safely to Kerbin from the MIR without the use of a capsule, so that in the event of an emergency they can escape easily. Most plans at the moment consist of a wing design of some sort based around a probe core with a parachute, some solar panels, and a tiny little engine to deorbit with. They're all very pretty, but even though the Kerbals manage to hold on just fine, I've been having issues with orientation during the burns (full throttle is not an option), and there's the sliiiight issue that every time you try to deorbit the vehicle catapults the Kerbal into space, away from the vehicle. Put a temporary hold on my "return Kerbals from MIR without a capsule" project because good grief is that difficult. 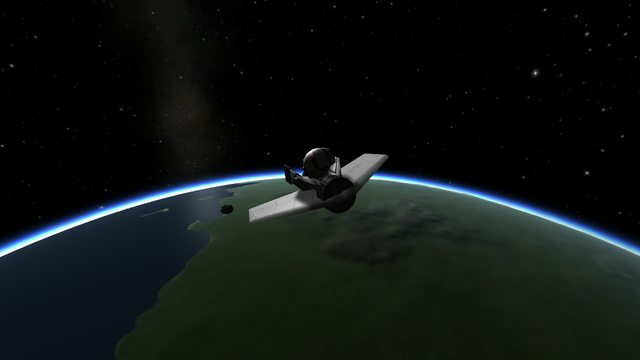 I finally managed to get a craft that flies fairly well on its own but the moment you put a Kerbal on it, the goddamn Kerbal slides right off. And turning it into a flying box defeats my hopes for an aerodynamic, lightweight return vehicle. So instead I decided to spend part of my day messing about with spaceplanes. Though they're mostly just planes with rockets attached at this point, since they haven't been doing very much space-ing. The primary issue is balancing plane side of things with the space side of things. Air breathing engines need air (obviously) and liquid fuel, which you get in the fuselage parts. But rocket engines need liquid fuel and oxidiser, the mix of which you only get in the rocket parts. So any spaceplane has to have enough plane-fuselage-fuel-carrying parts to get it to the point where the air is too thin for them to be any good, plus all the rocket-fuel-carrying parts so that the rocket engines can take it the rest of the way. And for both stages you have to lug about the unused/unuseable fuel. In steps Test SSTO 3.8! I had a variant of this craft with three turbojet engines at the back on the main fuselage attached to a tricoupler, but during the first two attempts at take off I clipped the lower two on the runway and they exploded. 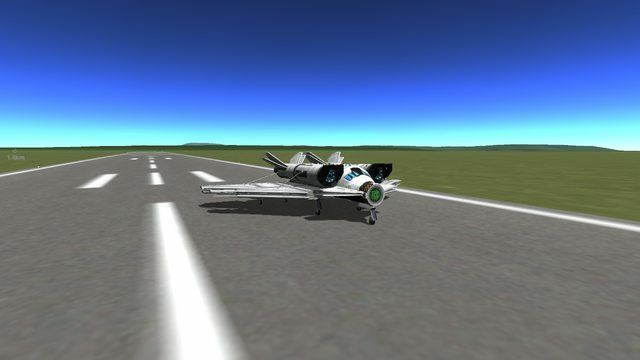 The plane still flew really well though, so I figured I'd just move the wheels and raise them so I could use all three engines. Turns out that it actually flies better when two thirds of its engines have been blown up. So this is the present iteration that has completed its atmosphere trials for the time being. The image doesn't show a plane that has drifted off centre on the runway on take off (as so may are wont to do), but rather a plane that has landed successfully and safely on the runway once again. In fact I landed it on the plains to the west of the Kerbal Space Centre too, then took it off again and flew it in. It still needs its alterations for spaceflight and docking, namely the addition of RCS tanks and thrusters. I was originally planning to put the docking port on the roof of the main fuselage, but the nosecose might be a better option, considering I've left it open for the time being and it'd allow for this craft to be refueled more easily (yessiree, I'm planning a refueler so you never have to End Flight on one of these). Once they're complete and the MIR is in a good shape and I've sorted out some sort of docking area for it to attach to safely away from other fragile things, it'll be part of the routine flights to the station. And if anyone else wants the .craft file when its completed, they're welcome to it. Though I still need to name it... But only once it's passed its tests! 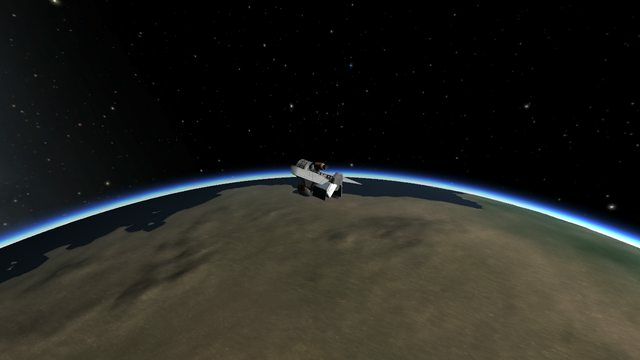 KSP 0.20 is out. For those of us involved in the MIR project, we should be able to update without screwing everything up. I think. And there are new parts, so that's always worth fiddling with. So I'm having problems with 0.2. I've built a buggy which is essentially a flat 2x2 piece stuck next to another piece. Coming off the corners are 4 wheels and on the top are batteries, generators and the new seat thing on the edge at the front, under the seat is a ladder which goes down to the ground so kerbonauts can climb up the ladder onto the seat except my game doesn't let my kerbanauts go from the ladder to the seat. How are you guys getting kerbonauts on the seat? zenburg wrote: So I'm having problems with 0.2. I've built a buggy which is essentially a flat 2x2 piece stuck next to another piece. Coming off the corners are 4 wheels and on the top are batteries, generators and the new seat thing on the edge at the front, under the seat is a ladder which goes down to the ground so kerbonauts can climb up the ladder onto the seat except my game doesn't let my kerbanauts go from the ladder to the seat. How are you guys getting kerbonauts on the seat? Tested this out with my new model of the Non-Capsule Return Vehicle. In EVA, you right click on the seat and click "Board". I beams, has anyone found them useful on rockets? I've seen posts of battleships using I beams for structural support, but nothing for rockets and space vehicles. Also, is it possible to transfer kerbanauts through the docking ports in 0.22 or do we still have to transfer them via the exterior of the ship? I haven't really used I beams, but it's not inconceivable that they could be used for things. And yeah, EVA-transfer for Kerbals. I can't decide whether this is the result of a surplus of time or a surplus of awesomeness. Potentially both. Round 2 was very impressive. I can't believe someone can get such an awkward shaped structure into orbit and then intersect with the hoop at high speed. If no one is up to it or is too busy now, then we can abandon it for now and I'll go back to playing with mods and posting interesting things and whatnot. Whoever made this trailer is a genius, I love it.